Radio networks for exchanging information and programming have been around almost as long as broadcast radio itself. Networks not only offer an economic advantage, since spreading the cost of programme production across several radio stations reduces the cost to each station, but they also permit a better and more complete service for listeners, incorporating, for example, national and international news and providing a distribution channel for third party programmes. Until very recently the only infrastructure within the grasp of independent radio stations in less-industrialized countries was the slow and notoriously unreliable postal system. The arrival of the Internet has brought new possibilities with it. The chapters in this section are case studies of three Internet-enabled radio networking projects: one national, one regional, and one global. Awakening from the Big Sleep, by Martin Hala and Santoso, tells the story of Radio 68H, a news network that links radio stations in Indonesia, a country that present a variety of challenges to any communication projects, not least because it is an archipelago made up of 17 000 islands that are home to 200 million people. Based in Quito, Ecuador, the Agencia Informativa Púlsar was the first major initiative to link independent radio stations via the Internet. At its peak, this Latin American service reached 800 radio stations. Bruce Girard's chapter explains how and why the agency was set up. Moving to the global level, Francesca Silvani's chapter, InterWorld Radio: The kind of thing that connects you to the world, describes a global daily news and audio feature service for radio stations provided by the Panos Institute and OneWorld International. Indonesia found itself in a unique situation under Suharto's New Order regime: there was strict state control of news broadcasts, but, at the same time, a relatively liberal environment for licensing small local radio stations. This spawned a rather unusual scene, with hundreds of small stations all over the huge country, independent in terms of ownership, but in terms of content restricted to rebroadcasting the rigidly censored news bulletins of the government's RRI (Radio Republik Indonesia) several times a day. Independent news programmes were prohibited. Apart from the official news, these privately owned local stations generally only played music and ran commercials. Even during the May 1998 riots in Jakarta, many local stations kept blasting heavy metal music at their frightened audiences, apparently oblivious to the social, political and human drama unfolding outside their windows, in front of their very eyes. Radio's journalistic indifference sharply contrasted with the print media, which were fighting - especially in urban centres - an uphill battle with the regime for more editorial independence. There was frequent banning of publications venturing too far into investigative journalism, and a whole samizdat underground emerged made up of writers either sacked from official journals, or even devoting their careers from the outset to the underground press. These journalists started organising themselves in institutions like the Alliance of Independent Journalists (AJI) and the Institute for the Study of Free Flow of Information (ISAI), operating on the fringes of the law, or outside of it. In short, unlike radio, there was a lot happening with print media, which was much livelier and daring, and far less complacent, than those in neighbouring Singapore or Malaysia. The problem, of course, was that print media had, and still have, very limited reach in a country so huge, and impoverished, as Indonesia. Critical journals like Tempo or Detik, even in the good times when they were not banned, had a relatively low circulation, and mostly only reached the urban middle class. The penetration of samizdat publications like X-pos, was naturally lower still. Even the very best of the print media could in no way compete with the broadcast media, especially radio. While the cumulative circulation of all papers published in Indonesia has been hovering around five million, there are now an estimated forty million FM/AM radio receivers in the country. A newspaper is usually read by several people, but radio sets serve whole families, especially in the countryside. By any count, newspaper readership is just a fraction of the vast masses tuning into radio. But what did these masses find on the air during the Suharto years? Similar to Eastern Europe, there were some foreign broadcasts aimed at Indonesia. The BBC, VOA, Radio Netherlands and Radio Australia all had Indonesian language programmes reaching the archipelago. These were, however, beamed to Indonesia on the SW band from afar. The sound quality was poor, even without the occasional jamming, and so was the relevance of most programmes. For most people, the RRI news bulletin was all there was for information, but this was mostly pro-government propaganda with little or no information value, so people didn't expect much from radio in terms of news. They tuned in to radio for the music and rarely thought of the potential of the medium for news and information programming. The huge potential of this powerful medium lay dormant for decades. There were always some people in the underground press who realized the potential power of radio, but there was little they could do, given the Suharto-imposed controls. These controls ended with Suharto's demise in 1998. The fall of the New Order regime led to a sudden liberalisation of media, easing of state controls and the fading away of old taboos. Radio stations were now allowed to broadcast whatever they wanted. The problem was, however, nobody had ever done independent radio news in Indonesia before. There was no basic radio journalism equipment, no experienced radio journalists, and often not even a desire to start producing independent radio news. Many stations argued that their listeners were not interested in news; they demanded music. That was of course true - since there had never been any relevant and reliable news broadcast on the radio, listeners did not even imagine it, let alone ask for it. In all of Makassar (Ujung Pandang), for instance, a major city of more than 800 000 inhabitants and the administrative centre for East Indonesia, there was only one radio reporter during the Suharto years, and he still remembers how hard it was to explain to people what he did for a living. As time was to tell, however, as soon as there was real news on air, listeners came running, and demanded ever more. In addition to news-challenged broadcast culture, there were a number of practical problems. Independent radios in Indonesia were mostly cash-strapped, shoestring operations with minimal technical facilities, minimal technical and administrative staff, and a couple of on-air DJ playing pirated tapes or CDs. There was no budget for computers, reporters, or the Internet. Obviously, fresh new ideas were needed to break out of this situation, and jump-start the very concept of news radio in Indonesia. Meanwhile, in far-away Prague on the other side of the globe, the newly established Center for Advanced Media (C@MP) was experimenting with digital audio compression, then a relatively new technology. C@MP and its Indonesian partner, the Institute for the Study of Free Flow of Information (ISAI), were already working together to support the print media, and they realized that digital audio compression could help circumvent existing constraints on radio news in Indonesia. The idea was simple. Since independent radio stations did not have the means to produce their own news in any significant quality or quantity, a solution was to rebroadcast national newsfeeds coming from a central production centre, and to share local news reports with other small stations. The state-owned network of relay stations that had been used to distribute the official newscasts in the Suharto era was not available for independent news, so the Internet would be used to distribute compressed digital audio. At that time, most people thought of Internet radio in terms of streaming or webcasting, technologies that were impractical given Indonesia's underdeveloped telecommunications infrastructure. A more feasible option was to distribute programmes via the Internet not in real time as streams, but in near-real time as compressed files sent to stations by email or downloaded via FTP. The local stations could then broadcast the programmes, reaching out to their regular audiences. Only in this way, by combining new and traditional media, could independent national programming reach significant numbers of listeners. The new medium of Internet provided a convenient substitute for the missing old media infrastructure, enabling the creation of a nation-wide virtual broadcast network offering much of the functionality of the brick-and-mortar relay system owned by the state, but at a fraction of the cost. On top of that, the Internet-based distribution offered a more flexible system allowing for easy feedback from participants, and two-way sharing of programmes. A news item produced in Aceh could almost instantly be heard in any part of the country with a participating station, and stations in Aceh could broadcast programmes produced by any of the other participants. In technical terms, we opted for MP3 format instead of the then-prevailing Real Audio, because it was easier to handle as files, as opposed to streams, and for a number of other practical considerations, like the better size-to-quality ratio at bit-rates needed for broadcast-quality audio. Another advantage of MP3 over Real Audio was the possibility to decompress files back to wave format for re-editing. Given the diversity of participating stations, this was potentially useful for members particular about maintaining the integrity of their broadcasting profile. Stations could edit the material, changing its form and emphasis to more reflect local sensibilities or interests, although in practice this was rarely done. The technology was the easy part. The organisation of the network was much more complex. Apart from the few promoters of the project, there was not much enthusiasm at first. Many of the potential member stations did not see the advantages, and there was generally a lot of scepticism concerning the appeal of news programmes for radio listeners. Another challenge was to form a group of dedicated radio journalists to service the production hub in Jakarta. As we have already observed, there were no radio journalists in the country and thus the entire team had to be built up and trained from scratch. The organizers used the clout of their parent institution, ISAI, a renowned and well-connected media organisation, to attract young journalistic talent for the production hub, and to reach out to small independent stations all over the country with an offer to join the network-to-be. Sometimes a little reluctant at first, local stations soon found it increasingly difficult to resist such offers. Once the concept took off, and quality, independent news began to be heard on air, it quickly proved to be a major audience-catcher. Listeners' expectations changed fast, and it became imperative for stations to carry news programmes, if for no other reason than the need to compete with stations that did. A production studio was set up at ISAI's office in Jakarta, equipped with a digital mixer and a computer. Next to the studio, a newsroom was built with more computers for journalists. C@MP provided the initial training for local trainers who would later spread the skills further around. The topics covered digitising of audio input into wave files, editing them on a computer, file compression, and various methods of distributing the compressed files to remote stations via the Internet, including maintenance of list- and mail-servers. After about a week of training, the whole operation was localized. Trainers and organizers from ISAI took over and from that moment on, they ran the show independently, relying on local initiative and innovation to drive the project. The network's growth began modestly. Radio 68H began with fourteen stations in locations selected to be more or less representative of the central islands of the archipelago. Stations representatives were invited to Jakarta in March 1999, where they were trained in both technical and journalistic skills, given a computer with preinstalled software, and instructed in the mechanisms of the planned network's functioning. The actual broadcast via these first fourteen stations started in April 1999. The amount of production was limited at first - just several one-minute programmes a day. This small amount of news nevertheless had a snow-balling effect, changing broadcasters' behaviour all over the huge country. There were 60 stations in the 68H network by August 1999 and 100 a year later. Radio 68H's members not only receive news for rebroadcast, they also produce their own news and send it to Jakarta for redistribution to the other network members. Most of the new members had never produced news and thus had to be trained by 68H staff. ISAI and 68H now organize eight regional training courses a year, covering editorial and technical issues. Some 300 journalists have been trained and many of these have become active correspondents for the network. Currently, there are about fifty regular correspondents, each contributing one to two local news items a day. The birth of the network coincided with rather hectic political developments, culminating, in mid-1999, with the first free elections in Indonesia in forty years. The situation was changing rapidly with new parties springing up and political alliances being formed and betrayed. All this was reported to listeners. Radio news was quickly established on the airwaves and, in some respects, became the main field for competition among local stations. As more and more stations carried news, it was difficult for their competitors to ignore it. As the number of member stations grew, so did the amount of production. A thirty minute news program, the Evening Bulletin (Buletin Sore), was introduced in August 1999. It became very popular, but it also increased pressure on the already inadequate infrastructure. For some of the stations, especially those in rural areas already struggling to download the one- or two-minute pieces, the bulletin proved too much, requiring several hours of a modem connection to download the thirty minute program. It was a formidable disincentive both for existing and prospective 68H member stations. The Internet, which had made it possible for the network to emerge, had become a bottleneck. It was clear that without a solution to the problem of insufficient bandwidth, the network would not be able to expand and might possibly collapse. The obvious solution to network congestion was satellite. Given the size and fractured landscape of the archipelago, satellite had long been used there for communication and broadcasting, and Indonesia had even launched a couple of its own satellites. After some shopping around, however, it became clear that off-the-shelf satellite solutions would be far too expensive for a project of this kind to employ. Once again, an innovative idea was needed. Such an idea materialized, just when most needed, in the form of an offer from PSN, a local Indonesian satellite company. Instead of using the standard, but very expensive digital audio system, or even the cheaper but still unaffordable Single Channel per Carrier technology (SCPC), PSN proposed to take advantage of its digital video broadcast (DVB) system. Originally devised for satellite TV broadcasting, the DVB package came with four 64 kbps audio channels. PSN offered one of these to 68H on an affordable basis. DVB is a common technology in Indonesia and elsewhere, and there was no need for expensive specialized equipment on the receiving end - standard, mass-produced satellite TV dishes and decoders were all it took for the member stations to receive the satellite feed. The downside is that the system only works one-way - local stations can receive programmes, but cannot send them via the satellite. For this, they would need an uplink, an expensive piece of equipment with regulatory implications. Once again, the creative integration of technologies provided the solution, and the Internet network that had been put in place earlier was used for the return channel. Local stations use the satellite link to receive newsfeeds sent from Jakarta and Internet for uploading their own programmes. Since there is far more programming sent from the hub then uploaded by individual stations, this asymmetric system works fine. Introduction of the new satellite-based distribution system was a major breakthrough that spawned further growth in both membership and programming. By the end of 2000, Radio 68H had 200 member stations. The aim is now to have a participating station in each of the countries 320 municipalities. The volume of programming, now uninhibited by the bottleneck of the terrestrial network, grew to 15 hourly editions a day between 06:00 and 21:06 West Indonesian Time. Three of these editions are longer, thirty minute programmes, the rest news bulletins of six minutes each. The total amount of programming rose from the initial several minutes to the current level of almost three hours a day. This phenomenal growth of course raises the question of the project's long-term sustainability. The endeavour was originally funded with a start-up grant from the Media Development Loan Fund and the Asia Foundation, and later with a grant from the Dutch Foreign Ministry's development program. From the beginning, the understanding was that this would eventually become a self-supporting project, financed primarily with income from advertising. To this end, the project was registered in January 2000 as a business entity under the name PT Media Lintas Inti Nusantara, with 60 percent of shares going to the management and employees, and 40 percent to ISAI as the parent organisation. With its unique profile and nation-wide reach, Radio 68H enjoys a high potential for advertising revenue. This potential has so far not been fully realized. One of the reasons seems to be the very novelty of its concept - potential advertisers have yet to fully appreciate it. The network's management has been trying to develop this potential by strengthening the marketing department and organising promotional campaigns. Advertising revenue is now slowly becoming a major source of income, gradually reducing dependency on outside funding. Developing a sustainable business model also means finding a suitable mechanism for sharing the advertising revenue among the network's members and the production hub in Jakarta. There are six minutes reserved for advertising in every half-hour of programming. At this point, about 30 percent of these slots are being used, generating income to cover some two thirds of operational costs. The network could become fully sustainable from advertising with a utilisation rate of roughly 50 percent. The income is shared between Jakarta and the member stations according to elaborate rules reflecting the stations' profiles, amount of Radio 68H programming used, and other factors. For many of the participating stations, especially the smaller and more remote ones, their share of the advertising pie represents a substantial boost for their bottom line, helping them in their own sustainability struggle. Apart from commercial advertisements, the network also carries a lot of public service announcements, another important source of income. Local and international non-profit organisations take advantage of the network's reach and popularity to distribute their messages to the most remote parts of the country. The Indonesian National Commission for Human Rights ran its non-violence campaign on the network, for example, since it was the only way to reach many conflict zones like Aceh, the Moluccas, and West Papua (Irian Jaya). Similarly, the Aceh youth wing of the second largest national Muslim organisation, Muhammadiyah, ran a campaign for religious tolerance on the radio, and the UN High Commissioner for Refugees ran an information campaign for East Timorese refugees in West Timor. These announcements combine the best of both worlds for both 68H and the sponsoring institutions - they spread important messages, and at the same time support the network financially. The 68H network now reaches about 20 million listeners all over Indonesia. According to an August 2001 survey conducted by the Association of Radio Stations in East Java (PRSSNI Jawa Timur) in fourteen major cities throughout the region, 68H is by far the most preferred source for radio news. Even some local stations of the state-run RRI have joined the network and rebroadcast 68H programming. The 68H network has undergone a period of tremendous growth in the past two years. But there is still potential for further development, in both technical and programming terms. After decades of forced hibernation, radio is coming alive in Indonesia, bringing reliable independent news, and a calming voice of moderation into the post-Suharto turmoil. The first major initiative to link independent radio stations via the Internet was the Agencia Informativa Púlsar, a Spanish-language Internet-based news and information agency specialized in providing services for local, independent and community radio stations in Latin America. Púlsar had a humble beginning in 1996, sending a daily news summary of 10-12 stories via email to forty-eight subscribers in Latin America. The main sources of information at the time were the websites of the few Latin American newspapers on the Internet and daily dispatches from Inter Press Service (IPS). A selection of news from these sources was rewritten in radio style and from the perspective of Latin American civil society and then emailed as a rip and read service. News staff at the stations were free to select the stories they wanted to use and even to edit them for language or local context. Five years later, just before it suspended its service, Púlsar's expanded services were being emailed to more than 2 500 subscribers, including some 800 radio stations and broadcast organisations, in over fifty countries and were freely available for download from the Web. The agency had diversified its news sources, adding, among others, a network of more than twenty correspondents and commentators. It had also added a variety of new services, including special thematic services, a indigenous Quechua-language service, digital audio clips, a complete audio newscast and a Web portal. For the first time, millions of listeners of Latin American local and community-based radio stations had access to a non-commercial independent news and commentary service that was rooted in the social, political and geographic reality of the region. Radio has long been the most prevalent and the most dynamic mass medium in Latin America. For most people, especially those in marginalized urban areas and rural communities, it is often the only mass medium available and usually the most important source of news and information. While African and Asian broadcast systems were heavily influenced by the centralized State-dominated traditions of their European colonizers, Latin American countries tended to adopt more liberal ownership structures and, with a few notable exceptions, the region has a diverse radio landscape. Most countries have one or more large commercial networks alongside hundreds of small independent commercial stations and non-commercial stations owned by churches, trade unions, municipalities, indigenous people's organisations and a wide variety of NGOs. State radio broadcasters are generally either cultural or official and in either case relatively minor players. Despite the recent growth of national commercial networks, which usually consist of a number of transmitters broadcasting centrally-produced programming to the provinces, radio continues to be the most local mass medium. Even in small towns it is common to find independent stations that produce all or most of their own programmes. 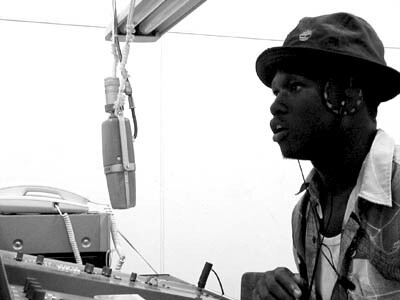 Radio speaks in the language and with the accent of its community. Its programming is about its community, involves community members, reflects local interests and contributes to both the heritage and the development of the cultures, economies and communities that surround it. This contrasts sharply with television - only 30 percent of Latin American television programming comes from the region; with 62 percent produced in the United States. However, while independent radio has a long history of informing about local events and stimulating local democracy, coverage of regional and international debates and events, increasingly important in the light of globalisation and efforts at regional integration, is generally abysmal. Few radio journalists are trained at analysing international news and even if they were, there are few sources of international news available to them. This lack of appropriate international news sources for radio has long been recognized in Latin America. As long ago as 1962 radio news directors and managers at a meeting organized by CIESPAL called for the establishment of a radio news agency and a few international radio news exchange initiatives have been established over the years. One of them was Informativo Tercer Mundo (ITM). Based largely on news bulletins from Inter Press Service (IPS) a leading independent global news agency, ITM's weekly programme was distributed on cassette to some one hundred radio stations. Its production values and its analysis were good, but delivery was by the post. By the time ITM programmes aired on local stations the news was at least two weeks old; often as much as six. The Internet, still new in Latin America, was about to open up a new range of possibilities. In 1995 a study was conducted with the support of the Canadian Bureau for International Education (CBIE) and the cooperation of the Ecuadorian NGO, CEDEP (Centro de Educación Popular) and the Latin American office of the World Association of Community Radio Broadcasters (AMARC) to identify ways the Internet could be used to support independent and community-based radio in Latin America. The study focused on three areas: (i) international news sources and practices among Latin America's independent and community radio stations; (ii) a trend towards greater concentration of ownership and control of radio broadcasting at the national level; and (iii) how the Internet could be harnessed to improve international news coverage and support efforts to promote diversity and pluralism of the region's radio stations. The research showed that for small independent radio stations, newspapers were the most important source of international news. For rural stations, these were often yesterday's newspapers from the capital. Other sources included foreign shortwave radio and, in urban areas, foreign cable and satellite television stations. While the major North American and European news agencies were only used by larger urban stations, they were influential since they are a primary source for the newspapers. The predictable result of this was that international news, including news from neighbouring Latin American countries, usually reflected North American and European priorities rather than Latin American ones. For a Latin American outside Colombia, for example, news about that country rarely dealt with the its internal tensions, its relations with its South American neighbours, or even its economy. News was more likely to be concerned with the relation between Colombia and the USA's domestic drug problem. Station representatives surveyed were generally aware of the poor quality of their international news in general and their news from Latin America in particular. Most were interested in improving this, but there was no obvious appropriate and affordable news source available to them. The study also looked at some of the major changes that were taking place in Latin American radio as a result of liberalisation of broadcasting and of the deployment of relatively inexpensive satellite technologies to form national networks. Liberalisation and deregulation of the sector had been successful in bringing about a dramatic increase in the number of radio stations in many countries, but this was not accompanied by a comparable increase in revenue for the sector. The result was fatal for many radio news departments. In Quito, Ecuador, for example, the number of radio stations increased by 300 percent between 1991 and 1996, but the amount spent on radio advertising increased by less than twenty percent in the same period - forty radio stations were operating with only marginally more advertising revenue than was formerly shared by ten stations. Competition was fierce and in order to survive new stations invested as little as possible in programming, using inexpensive automated formats and becoming little more than on-air jukeboxes. Established stations with a commitment to local news and information were under pressure to cut costs. News is expensive and in hard times it is often the first department to suffer budget cuts. Even after cuts, most radio stations remained in precarious financial positions. At the same time, new and relatively inexpensive digital satellite technologies were becoming available and were beginning to have a dramatic effect on the nature of radio in the region. National multimedia groups, with holdings in print, television, Internet and radio were setting up networks consisting of a single production centre and many repeater stations throughout the country. These networks were expanding rapidly, with the national groups purchasing or leasing stations in smaller cities and towns, shutting down their production facilities, and converting them into repeater stations with little more than a satellite receiving dish, a transmitter, and sometimes an office to sell local advertising. While the network stations had no local content, they enjoyed economies of scale and could invest large sums of money in production. They offered the latest music, popular talk shows, gossip, and political commentary that proved popular, especially with the young urban dwellers that most interested advertisers. The remaining independent stations were left struggling to compete or going out of business entirely. In many secondary cities and towns people knew the news, commentary, weather, traffic reports, music, and gossip from the capital, but had less information from their own communities and fewer opportunities to have their own voices heard. Radio was undergoing a rapid transformation. No longer an exclusively local medium, it was on the road to becoming a predominantly distant one. In Peru in 1995 three Lima-based networks had more listeners in the provinces than the fifty largest provincial stations combined. Local stations were in a precarious position. They were in a unique position to serve their communities and to contribute to media diversity, but in order to do so they needed to produce expensive local programming and to significantly improve their global and Latin American news and information. And they had to do this with fewer resources. In 1995 the Internet was just beginning the leap from a primarily academic network to a predominantly commercial one. It was the year AOL began offering Internet access, the number of Web servers in the world increased tenfold from 10 000 to 100 000, Netscape went public with the largest NASDAQ initial public offering in history, Internet Explorer was not yet available, and Real Audio made its debut. In Latin America the 1995 Internet frenzy went largely unnoticed. At the beginning of the year, seven of the eighteen Spanish-speaking countries still did not have direct access to the Internet. In the countries that were connected, service providers were located in major urban centres and long distance telephone lines were not of good enough quality to sustain a connection to the Internet. A second barrier to Internet use was that there was very little Latin American content on the Internet - perhaps a dozen mainstream newspapers and a few alternative sources dealing with particular countries or themes. Few people were convinced of the value of being connected to an Internet that had so little information in their language and about their reality. Not surprisingly, the survey and interviews of local independent broadcasters showed that only a small minority of them had access to the Internet and, of those that did, most of them used it for email only. Despite the difficulties, the Internet did seem to offer some promise for linking the region's radio stations. While its use was expensive compared with North America, it was still far less expensive than satellites and faster than the postal system. Connectivity, while still a problem, was a declining one. Many countries had recently privatised telecommunications and facilities were rapidly being extended and improved. The biggest drawback was the lack of content - there was little in Spanish, not much from Latin America and nothing that could be used on the radio without significant processing. Based on the interviews and surveys, the study concluded that local, independent and community radio stations both wanted and needed to improve the quality of their news and information, that there was need for more diversity of sources of news from the region, and that the Internet offered possibilities for accessing news about the region, for setting up and maintaining a network of correspondents, and for distributing news and information to radio stations. Building on these conclusions, AMARC and CEDEP decided to support the establishment of the Agencia Informativa Púlsar, an independent radio news agency making use of the Internet as a distribution mechanism, as a source of news, and as a two-way channel for communicating with correspondents. 1. Identifying appropriate sources of accurate and high quality news and information on the Internet. These included both mainstream sources, such as online newspapers, and alternative sources, such as specialized news services directed at human rights or environmental networks. 2. On a daily basis, searching out international news and editing it in radio style for distribution to radio stations via the Internet, prioritising news from Latin America and the Caribbean. 3. Establishing a regional network of correspondents who feed news into a news pool available to all community radio broadcasters. 4. Providing training and support to community radio broadcasters wishing to receive the service and/or to make full use of the Internet in their programming. Púlsar began in March 1996, sending a daily news summary via email to forty-eight subscribers in Latin America. The main sources of information at the time were websites of the few Latin American newspapers on the Internet and daily dispatches from Inter Press Service (IPS). Two part-time researcher/editors daily sifted through the news on the Internet, coming up with a selection that included both the main news items of the day as well as news items that were not on the international agendas. The key criteria were that the news be from Latin America and that it be selected and presented in a way that emphasized regional perspectives and the concerns of civil society. News staff at subscribing stations were free to select the stories they wanted to use and to edit them. The agency quickly expanded. The number of subscribers to the basic service increased from forty-eight in 1996 to nearly 2 000 in 1999. By the time the service was suspended in 2001, radio stations and independent radio production groups were the largest subscriber category, accounting for about one third of the 2 500 subscribers. Non-governmental organisations and universities also subscribed to Púlsar's free services, as did a few hundred individuals. Significantly, more than one third of subscribers were from outside Latin America. Many of these were community radio stations in North America and Europe with programming for local Latin American immigrant communities. The agency also added a number of new services. By the end of 1996 the monthly Comunicado, a newsletter for Púlsar subscribers with tips on how to make better use of the Internet in their programming, was added. The daily digest of news stories was renamed Compendio and a new service, En Línea, made news stories available throughout the day as they became available. En Línea was added to better serve stations with more frequent email access. Compendio and En Línea subscribers could also choose an optional audio service which offered short clips sent in by correspondents - the voice of a woman in the market commenting on new economic measures, for example. The clips were sent by email as compressed (mp3 format) files. Ciberbrujas, produced in collaboration with RedADA, a Bolivian NGO, was a weekly service featuring news and information about Latin American women. Ñuqanchik, was a daily news service in Quechua, the main indigenous language in the region, spoken by some eight million people (see box). Probably the most important indigenous language in Latin America, Quechua was the language of the Incan empire and is today spoken by seven to ten million people in the region, the majority of them in Peru. Radio is by far the most important medium for the Quechua-speaking community, not least because it is primarily an oral language. * According to a 1996 estimate, some 180 Peruvian radio stations regularly offer programmes in Quechua. Most of these stations are isolated from one another and their communities have few opportunities to develop common perspectives on national and regional issues. Between August 1997 and April 1998, Púlsar, the Centro Peruano de Estudios Sociales (CEPES) and the Red Científica Peruana (RCP) collaborated in a joint experiment to produce and deliver daily Quechua-language micro-programmes to a network of mostly Peruvian stations. The service was called Ñuqanchik, a Quechua word meaning both we and ourselves, and received financial support from UNESCO. 1) Quechua radio stations are among the least likely to have access to the Internet. Indigenous people are among the poorest in Peru and their communities are often without electricity and running water, let alone telephone service. 2) A Quechua-language service would have to be an audio service and the larger file size necessitated a better Internet connection than a text-based service did. While the stations did not have the necessary equipment to receive audio via the Internet, cabinas públicas (community Internet access points) and cyber cafés were beginning to appear in many market towns and it was hoped that stations could get to them at least once per week with a cassette tape to record the programmes for later broadcast. It was even technically possible for the stations to send their own news, commentaries, and programmes via the same channel, turning an informational service into a low-cost participatory network in which everyone could be both correspondent and recipient. At the end of the experimental period the service was suspended. The main reason for its failure was the inadequate telecom infrastructure in rural Peru. Since then Peru has made substantial investment in basic rural telecom services, with the goal of having telephone and basic Internet service in every community. Ñuqanchik was ahead of its time, but valuable lessons were learned for how to produce and distribute Quechua-language programming at low-cost. The infrastructure might soon catch up with the ideas. It is common to say that new communication technologies are going to lead us to a world in which we all share the same culture of cyberspace and speak the same language. The Ñuqanchik experience showed us that this homogenised world does not have to be the only option. Applied imaginatively, new technologies can also offer possibilities for pluralism and cultural diversity. * Following the conquest, missionaries introduced a written form of the language based on the Roman alphabet. However, Peru's formal education system shunned the language and even educated Quechua-speakers were unlikely to be able to read and write in the language, since their education was in Spanish only. As connectivity improved in Latin American cities, Púlsar added more high-bandwidth services, such as a website updated several times each day and downloadable news bulletins. However, the basic emailed text service, accessible to any station with an email account, was maintained. The goal was to provide service at a number of levels: from emailed text, through audio clips and up to web-based full audio. The additional cost of producing and distributing extra levels of service was minimal. By offering these different levels of service Púlsar could ensure that subscribers with limited access would not be left behind. New subscribers could adopt the service at their current capability, and then request new services as their own access and expertise permitted. Púlsar also expanded its themes and sources. While in the beginning most of the news came from websites of mainstream newspapers, alternative sources were cultivated, including specialized press agencies, and a network of correspondents in Latin America and Europe. Finally, Púlsar expanded its network and improved its services by focusing on training, including training of its in-house editors, its correspondents and its users. The agency's first training activity was a Viaje Virtual (Virtual Voyage). It was a website on a diskette that was distributed to hundreds of stations just before the agency's launch. The diskette contained a manual about Internet use, instructions for how to get connected to the network, and information about Púlsar and how to receive the service, all in the Web's HTML format. Mixing old and new technologies from the start, Púlsar distributed the diskette by mail to hundreds of stations in the region with simple instructions for how to use it. Even a compact offline browser was included on the diskette, since in early 1996 most computers in Latin America did not have browsers installed. More traditional training sessions were conducted for users throughout the region, usually in partnership with local broadcast networks. Since the Internet and email were new to the region, the training sessions focused on demystifying the new technologies in terms of access and cost and training in basic email skills. Training sessions were always used to evaluate Púlsar's service. For correspondents, guides were produced to supplement annual training sessions and as aids for distance training and evaluation. The Cartilla para Corresponsales, for example, provided detailed style guidelines for themes, formats and language. Another correspondents' guide focused on the inclusion of audio in correspondent reports, covering both technical and format questions. In June 2001, after five years of operation, Púlsar's services were suspended. The reasons for shutting it down stemmed from financial and political problems in the Latin American office of AMARC, the organisation that managed the agency during the previous three years, and were unrelated to Púlsar. AMARC has since announced its intention to start the service again, and as of October 2002 a weekly bulletin is being distributed. The challenges Púlsar took on during its first five years were journalistic, providing radio stations with a Latin American source of regional news; political, supporting independent and community radio; and experimental, examining and testing the opportunities presented by the combination of broadcast radio and the Internet. As a journalistic project Púlsar demonstrated that it was possible to use the Internet to provide a low-cost news service tailored to the needs of independent and local radio stations. While there was much room for improvement, the steady increase in subscribers and an analysis of feedback received indicates that the journalistic quality and editorial line of the agency were appreciated. As a political project the agency sought to contribute to the diversity of voices on the airwaves and to amplify independent and critical voices from Latin America. Púlsar made an important contribution to the diversity of perspectives on radio in Latin America, although this was counter-balanced by the increasing centralisation of ownership in the sector that we have already discussed. As an experimental project Púlsar enjoyed its greatest success. As the first major initiative to link radio and the Internet it demonstrated a range of possibilities for combining the two media to support pluralistic and independent media, an essential prerequisite for democratic development. In so doing it also became a model for many other initiatives in Latin America and elsewhere. It's one o'clock on a Saturday afternoon. We're sitting in the makeshift studio of Radio Rhino, a small independent FM radio station in the northern Ugandan town of Lira. The studio, which is the entire radio station, is soundproofed with egg boxes. But three of us are keeping still and quiet, as the technician switches on the expensive-looking WorldSpace digital receiver and holds a microphone up to the speaker. 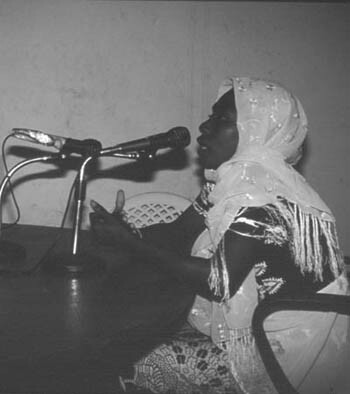 The crystal clear voice of the BBC World Service newsreader fills the room, and Radio Rhino begins broadcasting its news, live, to a potential listenership of six million, in and around the town of Lira. It's obvious from the nonchalance and expertise that accompanies Radio Rhino's news broadcast, that this is something that happens every day. This brief description raises all sorts of questions. How do radio stations get international news? How do they use new technologies? What does it mean that local stations are able to so easily broadcast BBC news? Will new technologies make it easier for established international broadcasters such as the BBC to dominate the airwaves? Will it also be easy for foreign commercial broadcasters to dominate the global airwaves? How can a small, struggling, independent station such as Radio Rhino find an alternative source of news and information? Does it want to? These and similar questions were central to the foundation of InterWorld Radio, an Internet-based radio news and features service run by the Panos Institute in partnership with OneWorld International. Equally important was an understanding of new challenges and opportunities confronting pro-development communication initiatives, and of the key role that radio continues to play. Radio is increasingly acknowledged as one of the most important media for involving the public in development processes - not only for rural areas where TV and newspapers do not reach - but even for urban centres. Radio is in a growth period, especially in developing countries where liberalisation policies and low-cost FM broadcast technologies have enabled the emergence of thousands of new stations, both commercial and community-owned. There are now 38 FM radio stations in Uganda and 50 in Ghana. These are commercial, not community media since they are not owned or governed by a community, but they provide critical opportunities for public debate and, with imaginative programming, real opportunities for perspectives from different communities to be heard. While these stations tend to serve only small geographic areas, are urban focused and often driven by advertising and consumer values, they are also hugely popular, very significant in shaping public opinion and offer new and important opportunities for public interest programming and debate. It is also clear that many from this new generation of popular urban FM stations do not have the resources, networks, skills or experience to gather international news or to offer their listeners interesting, high-quality news and features from other countries. Yet given the crucial role they play in development and democracy - it is vital that these stations gain access to such programming. InterWorld Radio was designed to fill the gap. InterWorld Radio is a free, English language, daily news and audio feature service for radio stations. It is funded by the Ford Foundation, the UK Community Fund, and the UK Department for International Development. By commissioning and distributing short audio features from a pool of local journalists around the world, InterWorld Radio provides a regular service of topical features designed for broadcast within magazine programmes or as discussion pieces for phone-ins or studio debates. InterWorld Radio also publishes a daily international news bulletin of up to eight items and distributes it to radio stations by email, and from the website - the main interface for the service. InterWorld Radio sees the Internet as one way of offering radio stations content in different formats depending on the needs and limitations of the users. This can range from low-tech text-based email bulletins and newsletters, through to scripts stored as file attachments on the web site, low-quality audio files that can be streamed-on-demand or downloaded for broadcast, and all the way to FM broadcast-quality audio files. Founded in 1986 the Panos Institute exists to stimulate debate on global environment and development issues and to promote the plurality and diversity of media. Panos has long recognized the role of radio in development. Panos' global radio strategy is still evolving, as is the broadcasting sector itself, but at its heart lies a commitment to radio as a key player in many of the processes that involve communities in public debates and lead to change. Panos London's regional centers in Kampala (Uganda), Lusaka (Zambia), and Kathmandu (Nepal) run regional or local radio projects using a range of innovative methodologies. The independent Panos Institute of West Africa's (PIWA) Banque de Programmes Online did on a regional level many of the things that InterWorld Radio does more globally. While PIWA maintains its programme production and distribution systems (and is also exploring satellite distribution), it now focuses mainly on working directly with radio stations, providing technical assistance, and increasingly training in management and networking. Panos Paris, as well as looking at satellite distribution, is also providing analysis of and support to the Central African broadcast environment. As part of this stable of radio projects, InterWorld Radio, currently based in London, complements the regional projects. Unlike some other Internet-based radio news and features services, InterWorld Radio is available free-of-charge to all radio stations that want it. Worldwide, the community radio movement is succeeding to some extent in demonstrating why it is important that communities should own and run their own local radio stations. InterWorld Radio, on the other hand, is part of a complementary movement in which the ownership of the airwaves is less important than the public service role that radio stations play, a role that can be fulfilled by stations regardless of their ownership model. InterWorld Radio, therefore, is equally available to radio stations that are state-owned, public, community-owned or private and commercial. InterWorld Radio is the only radio project within Panos designed to have a global reach and to work primarily in the English language. As such, the 'typical' radio station that InterWorld Radio targets to work with is an urban-based radio station that broadcasts some or all of its talk schedule in English. It could be either private, community or state-owned, broadcasting locally in FM or nationally on AM and will probably be taking advantage of the interactivity and participatory nature of radio by hosting studio debates and phone-ins. In short, a radio station much like Radio Rhino mentioned at the beginning of this chapter. Radio Rhino's owner and former director, Andrew Ocero, prides himself on the editorial independence of the radio station and speaks with obvious pleasure about the shows where his broadcasters are able to challenge local politicians and public authorities by getting them in to the studio and grilling them, live. But the big challenge for Panos and InterWorld Radio was - and still is - to find out whether radio stations like these want or are able to use international English-language content in their programming schedule and whether they are able to use the Internet to get it. WHY PUT AUDIO ON THE INTERNET? As early as 1986 Panos Radio, in London, was producing radio documentaries and distributing them to radio stations in developing countries by cassette - a laborious and expensive way of distributing audio programmes. The main selling point of Panos Radio programmes was that the items were commissioned from local journalists and reflected unique perspectives on development issues. In their reports, journalists had to get out of the studio and into their own communities so that audiences all over the world could listen to the voices and views of ordinary people - so often ignored in the international media. Throughout the 90s, the cocktail of radio stations ordering Panos Radio programmes began to change from being predominantly state-owned or public broadcasting corporations, to include local radio, independent radio, FM radio and community radio. But monitoring and evaluation to judge the impact of each series revealed that although the programmes were broadcast, they were often simply inserted in to a station's schedule without being adapted for local audiences, and thus did not realize their full potential for contributing to development initiatives. Panos decided to look for a way of producing a more rapid and regular service, one that would involve local broadcasters in the process of producing and adapting content. This began to seem even more vital given the changes that were taking place in the broadcasting sector as new stations went on air with new ideas about how to make radio. While the inclusion of hard information seemed to be prioritised less on the newer radio stations than on older public or state-owned stations, the early fears that FM radio would turn into a miasma of lowest common denominator music programming have often proved unfounded. Some of the most popular and compelling programming on the new stations has turned out to be talk-based radio, with phone-ins and studio discussion programmes often stretching formerly rigid boundaries of political expression. It became clear that for any international audio content to be relevant it would have to match the increasing vibrancy of the sector. Meanwhile, there was a growing interest in the implications of new information and communication technologies (ICT) for radio. The international development community already recognized that there was some potential for new ICTs to play a part in tackling poverty - but several important initiatives began to stress the importance of linking traditional and new technologies in order to reach wider audiences. For example, the Global Knowledge Action Plan, a statement from the Global Knowledge Action Summit that brought together major multilateral and bilateral organisations (including the World Bank and several UN organisations) in Kuala Lumpur in 2000, placed priority on integrating existing with new technologies for access to content and on the importance of distributing broadcast quality audio over the Internet, thereby making use of existing and new convergent technologies. The idea for InterWorld Radio was born out of a spirit of convergence, not simply between old and new technology, but between the ideas of Panos and OneWorld Online - two respected organizations working with information and communications in developing countries. Panos wanted to find a way to modernize its editorial service for radio stations, and at the same time, OneWorld Online was experimenting with ways to encourage radio stations to join in the information revolution that was already successfully transforming other parts of civil society. OneWorld Online had already run a pilot project called OneWorld Radio News Service, which was conceived as a database for radio stations to exchange locally-produced content. Although this service failed to reach a wide audience some of the lessons learnt from this early pilot project, such as the importance of file size and the need for quality editorial content, were instructive for InterWorld Radio. In theory, InterWorld Radio was putting quality editorial content on the Web at the same time as many different organizations - including Panos and OneWorld Online - were planning to work in the realm of connecting radio stations to the Internet at the other end. Except of course in practice it has not yet happened. Internet access for radio stations in developing countries remains a challenge, especially in Africa. Kumah Dra at Radio Ghana says that he joined InterWorld and tried to download once, but it took 30 minutes and broke off. It's a very old computer. I do have a laptop that I could connect at an Internet café, but it's expensive. Projects that have tried to put audio content on the Internet in Africa have largely failed so far. The last few years have witnessed a major puncturing of the inflated expectations invested in the Internet. The dot-com crash in the North coincided with a more realistic assessment by development organisations of the potential of the Internet. It is not likely to become a mass medium in Africa where even now less than one percent of the population has access. Yet Panos is more committed than ever to the InterWorld Radio brand that it has established, and believes that the level of interest in the content and format of the news and features that InterWorld produces, justifies attempts to take forward the technology side of the project, within a much wider strategy. Radio stations still need access to email and the World Wide Web, still need to be able to broadcast high quality international content and journalists still need to be able to report on their local stories with local voices for an international audience. WHAT HAS INTERWORLD RADIO ACHIEVED? Since the launch of InterWorld Radio in August 2000, 125 radio stations in 59 different countries have joined the network - over half of them in developing countries. Figure 1 shows the geographical spread of current members. 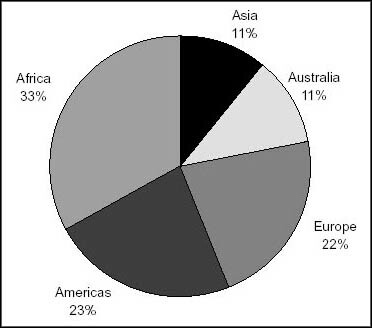 There are clear geographical differences between the type of radio stations that join: in Africa and Asia most members classify themselves as either independent or commercial, whereas in Europe and the Americas most of the stations are community-owned. While there are quite active relationships with some African community radio stations, they are not are target members, since many of them broadcast primarily in local languages. Sometimes the bulletin is read out in its entirety, but more often than not, it is incorporated in to other pieces. It gives perspectives not covered by other media, including the BBC. We use up to three of the bulletin pieces throughout the day, in English and translated into other languages. The InterWorld News Bulletin is uploaded to the website at 13:00 GMT every weekday, and emailed directly to the 93 radio stations that requested this when they joined. Next to the home page, the news is the most popular page on the website, with the news bulletin being downloaded on average by 100 visitors a day. The bulletin is produced in the London office through a process of scouring many sources of news and information, primarily on the Internet, and packaging a selection in a radio script format, ready to read out on air. The editorial strategy aims at covering mainstream news as well as unreported or difficult-to-report items about global issues that affect development. There is no reason for the newswriter to be based in London, so the aim is to move the news production to one of Panos' southern offices. By collecting feedback from members, it is clear that the news bulletin is used in a variety of ways - with some stations using only one or two items and others reading the entire bulletin. Although our [local, African] journalists are fine with news, when it comes to doing features, it's a different ballgame. What you're doing is a whole new approach, the transfer of knowledge, the move away from current affairs into going deeper, it's very good. In the 18 months it has been operating, InterWorld Radio has commissioned and produced 80 features from 37 countries - the vast majority from local journalists working in their own country. Nearly three-quarters of the features so far have come from developing countries, and as efforts to identify and recruit journalists bear fruit, this proportion is set to rise. Only members with a password can download a broadcast-quality file and this makes it easy to monitor the download history of each feature, and of each member. Two of the most popular features have been from Brazil, about residents of a favela learning to use the computer, and from East Africa, where pastoralists from different tribes talk about their experience of leaving home to settle in a big city. Although stations in Africa that can download choose predominantly features from Africa, they also download features from outside the continent. For example, Joy FM in Ghana downloaded a feature from Porto Alegre in Brazil about an innovative participatory budget. The international broadcasters, such as Deutsche Welle, and many of the stations in the North, download almost everything. Many of the members that regularly download broadcast the features as part of a magazine programme or as an introductory piece to spark a discussion. Radio ZNBC had its phone lines cut off for non-payment of bills. It paid half but still got cut off, so we've been using friends' accounts to check emails. We need technical advice. I'm not sure what kind of computer we've got, whether it's got a sound card. I think we'd be willing to pay a small fee to be able to use a reliable access centre. Since launching the service, Panos has carried out feedback surveys with members who join but are unable to download programmes. The panoply of reasons only serves to confirm what is already well documented - that access is not simply about connectivity, but also about basic PC equipment not being audio compatible, about skills and training, about who has access to the PC with the Internet connection, which is often in the manager's office, and about cost. InterWorld Radio needs to be part of a much wider strategy for enabling radio stations and programme makers to access the Internet and it is in the early stages of a long term collaboration with other partners interested in working with access for radio stations, particularly in Africa. In the meantime, the range of options InterWorld Radio offers, including text based services, and lower quality audio features, needs to be promoted more clearly on literature and in our correspondence with radio stations. In particular InterWorld Radio's website, which is currently being totally restructured, needs to show much more clearly the range of options available, and signing up for IWR's services should also be possible via e-mail, rather than just through the site. Furthermore, IWR needs to look beyond the Internet as the only solution for delivering a rapid, regular audio feature service to radio stations. It is possible that in countries where connectivity will remain a problem for many years to come, delivery by satellite feeds should be explored (as Panos West and Central Africa are doing). At the time of writing, InterWorld Radio is in the process of re-designing its website. The new site will incorporate a large amount of information about how to organize and structure news and audio features for distribution over the Internet. It will also offer new functions - such as a facility for adding text-based scripts for each feature, sound bites that producers can download to remix, features in languages other than English, and the ability for users, including broadcasters, to send an email to contributing journalists. Downloading can take as long as 10 minutes, with interruptions. I've used features in my 1-hour variety programme - Kingdom Today - though never a feature in its entirety. I've always supplemented it with studio discussions and interviews. Using the Internet is expensive and access is limited - we'd prefer emailed communications. Radio Phoenix still uses the InterWorld Bulletin but not the audio features. Although InterWorld Radio set out to produce finished features that could be slotted in to existing programmes, the features are being used much more creatively than this. Programme makers want to be able to use parts of interviews, vox pops, and actuality to mix in to their own programmes, or to translate into local languages. We are therefore restructuring how we upload audio to the website, so that members can download unmixed pieces of the feature, rather than the whole feature. InterWorld: Simply information that no one else covers. Without any strategic marketing drive so far, InterWorld Radio has succeeded in reaching radio stations in the north, most of whom have no problems downloading the large broadcast-quality files. Some of these members download and broadcast most of the features we upload and northern audiences should become more of a strategic priority for InterWorld Radio, with the aim of enabling voices and perspectives from the south to reach audiences in the north. InterWorld Radio has so far failed to take advantage of the potential offered by existing networks that distribute content to radio stations. Originally the project was designed to work with - or even create - download centres or hubs that would copy audio on to cassettes for local or regional distribution. In practice it is apparent that it may often be better to reinforce the work of existing networks set up to distribute content. An example of this is Democracy Radio, based in Cape Town, South Africa. Run by the Institute of Democracy, this project produces a weekly programme dealing with issues around democracy, such as how Parliament works, or a new policy on education. Every two weeks the programmes are put on a CD and mailed to a network of 30 stations that have no other way of receiving them. Brett Davidson, a journalist there, says he hopes to be able to use their CD distribution to provide some InterWorld Radio packages to the South African stations in the Democracy Radio network. In a similar way, InterWorld Radio's news bulletin is often redistributed by existing networks, including the MISANET news exchange, run from Namibia by the Media Institute of Southern Africa. I think it's great to be able to give isolated South Africans a better connection with some issues in other parts of the world. - Brett Davidson, journalist at Democracy Radio. To date commissioning and production for the InterWorld Radio news and feature service is centred in London. Yet InterWorld has quickly learnt that it needs to have closer ties with radio stations, and in particular, with programme makers or broadcasters working on popular programmes. It cannot do this with its team based in London, and, technically, there is no reason why the heart of the editorial team needs to be based there. As a result, InterWorld Radio has kick-started a strategy for establishing radio units in two of Panos' regional offices in Africa. The radio units will be equipped with digital editing facilities and a producer to commission and upload features every week. These radio units will also play a vital role in identifying the key most popular and influential radio programmes broadcast in urban centres throughout the region. In this way, InterWorld Radio can, through its regional offices, support local programme production that incorporates the news and features from InterWorld and other sources in to a magazine-style format for national and regional distribution. Communication Corner in Nepal, for example, uses InterWorld Radio features in the two magazine programmes it produces for airing on a network of FM radio stations in the Kathmandu valley. It is this level of programme production support that will enable InterWorld Radio to become sustainable in one sense of the word: once local programme makers are generating locally relevant content using international news and features, they won't need to depend on a service such as InterWorld Radio. InterWorld Radio is a content-focused project, having invested a large proportion of its budget in the first two years in establishing a strong independent editorial service and commissioning high quality reports that broadcasters can use in existing radio segments. It remains a unique service for radio stations in developing countries. In the context of the rapidly changing radio environment, InterWorld Radio aims to work with the expanding urban FM independent sector, and has managed to carry out its aim of helping radio stations fulfil a public service role. The process of liberalisation continues, the entry costs of establishing radio stations are decreasing and the regulatory environment in most countries is becoming more flexible. Consequently, the explosion in radio stations that has occurred over the last half decade continues and the number of radio stations that want or are likely to want to use InterWorld Radio is rising rapidly. That said, however, InterWorld Radio is also a technology project that relies heavily for its success in finding a way to ensure that radio stations in developing countries can gather international content from the Internet. As such, a core part of InterWorld Radio's activities in the next stage of the project will be to become part of a wider strategy to improve radio stations access to new technologies and to support their use of those technologies to produce high quality content. Detik, Tempo, and Editor were all banned in 1994, for exemple. With a population of 200 million, Indonesia is the 4th most highly populated country in the world. Its communication problems are exacerbated by its geography - it is an archipelago made up of 17 000 islands, 6 000 of which are inhabited. MP3 (MPEG-1 Audio Layer-3) is a technology and format for software compression of audio while preserving the level of sound quality when it is played back. Media Development Loan Fund (MDLF) is the parent organisation of C@MP. UNDP Human Development Report, 1999, p. 34. Of the 30% of television programming that is from the region, very little is local. Much of it comes from regional production centres in Mexico, Argentina and Brazil. The Centro Internacional de Estudios Superiores de Comunicación para América Latina - CIESPAL - is a research, training and production centre specialising in media and communication in Latin America. Initiated by Chasqui-Huasi in Chile, ITM production later moved to ALER in Ecuador. Its name was later changed to La Ronda Informativa and it is now distributed by ALER's ALRED satellite service. Bolivia, Dominican Republic, El Salvador and Guatemala got their first host computers in 1995. Cuba, Honduras and Paraguay followed in 1996. John Musuku, Zimbabwe Broadcasting Corporation. See chapter 4 by Attias and Deflander for more about Panos Institute of West Africa's projects. Global Knowledge Action Plan, Page 10, Item Access (4), Global Knowledge Partnership, 2000. Any visitor can download lower quality files from the site. Evidence indicates that some stations that are unable to download the large broadcast quality files, do download and use the smaller lower quality audio. However, IWR is not able to monitor this use. Germany's official international radio service.